Bain marie comes in a wide variety of shapes, sizes, and types, but traditionally is a wide, cylindrical, usually metal container made of three or four basic parts: a handle, an outer container that holds the working liquid, an inner, smaller container that fits inside the outer one and which holds the material to be heated or cooked, and sometimes a base underneath. Under the outer container of the bain-marie is a heat source. 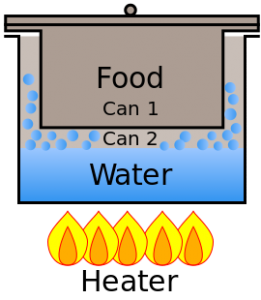 Typically the inner container is immersed about halfway into the working liquid. The smaller container, filled with the substance to be heated, fits inside the outer container, filled with the working liquid, and the whole is heated at, causing the temperature of the materials in both containers to rise as needed. The insulating action of the water helps to keep contents of the inner pot from boiling or scorching. When the working Bain marie the liquid is water and the bain-marie is used at sea level, the maximum temperature of the material in the lower container will not exceed 100 degrees Celsius, the boiling point of water at sea level. Using different working liquids in the lower container will result in different maximum temperatures. Short presentation of a malfunction in bain marie equipment to maintain a constant temperature preparation or simply bain-marie. This bain marie contains a tank containing heat transmission agent a fixed quantity of water, a water heating element, thermostat controls water temperature and adjusts each and rearm safety thermostat for overheating and a network switch. In this case organoleptic damage defended ascertained that water is not heated the Bain marie . Check this with the aid polimeter network voltage before and after the switch. If this switch tensuinii to check out this voltage across the element. In case of lack of blood supply can cause overheating and the thermostat will reset its inset. If acetate is rearmed and still have the element’s voltage will proceed to change the thermostat temperature control. when there’s voltage element and it still does not heat the item is damaged and need replacing it with a similar one. Final check will be done with bain marie the right level of water and using an electronic thermometer, comparing the set value of the temperature control thermostat and water. If the temperature is maintained in permissible limits, and ended the repair of the device can be reassembled. After collate bain marie will be left in operation after more than four hours of operation that can be refundable the bain marie.